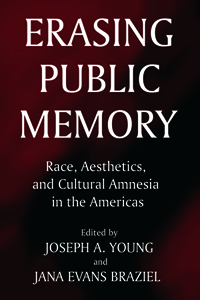 Erasing Public Memory is an inquiry into the canon of Western civilization that exposes the ubiquity and contiguity of racialized rationalism and how it constitutes standardized notions of beauty, memory, and public culture. Such an analysis is cosmically instructive, even though the editors and contributors may find themselves at the cusp of a crucible, an intellectual practice that might grant interrogations of racially inflected paradigms not all equal in import. The axis of race in the Western canon, uninflected and theorized, the goal of Erasing Public Memory is a move toward the de-reification of race as a priori ground of Western knowledge.